The staff was attentive and tried to accommodate for all of our needs. For example I asked if there was somewhere nearby to find a pre-paid sim card, and rather than just telling me, they actually ran around the neighborhood and tried to find me one!. Well maintained, like new, Friendly staff, Laundry Coin, high speed internet connection, spacious. Overall service was excellent. We booked for 2 adults, 2 teens and 2 boys under 10 years, buy mistakes system consider only 4 adult. At 2nd day, front desk ask us for number of people stay, unlikely other property ask for more money, Mimaru provide us additional towels for the boys without additional charge. In syaa Allah, will come back to Mimaru. Location is a short 5 minutes walk from Inaricho Metro Station and there are plenty of good food and convenience stalls around the corner. The staff even try to provide complimentary rental of appliances for the room and even for your walkabout like 360 cameras. The room is very comfortable and clean. There are even umbrellas you can take along if it's raining. The place is very well maintained and the front desk is quite helpful. Its near inaricho station. Its clean. I love the bathroom with bathtub. Also the kitchen with microwave too. The resepsionist is very nice and helpful. It is nice, clean and big room. There are lot of space for group of 4 in one room especially the bath room that was well designed, 2 or 3 people can use it at the same time. Everthing in room is new and clean. The staffs are good in english and helpful. The location is good not far frim metro and asukusa temple. I love how nice the hotel. Responsible and informative front office. The room quite big enough, with new furniture and very clean. Very nice for the new apartment service everything new and have a big toilet and space for you to arrange your big luggage. I would recommend this for 3 persons in room only if for 4 it'll be too much. Lock in a great price for MIMARU Tokyo Ueno Inaricho – rated 9.3 by recent guests! MIMARU Tokyo Ueno Inaricho This rating is a reflection of how the property compares to the industry standard when it comes to price, facilities and services available. It's based on a self-evaluation by the property. Use this rating to help choose your stay! Located 2 miles from Tokyo Skytree and 2.6 miles from Ryogoku Kokugikan National Sumo Stadium, MIMARU Tokyo Ueno Inaricho offers free WiFi and units equipped with a kitchen. The accommodations have a hot tub. All units include a private bathroom and have air conditioning, a flat-screen TV and a microwave. A fridge and electric tea pot are also provided. Japan Imperial Palace is 3.1 miles from the condo hotel, while Chidorigafuchi is 3.7 miles away. Tokyo International Airport is 19 miles from the property. When would you like to stay at MIMARU Tokyo Ueno Inaricho? This family room has a microwave, kitchenware and soundproofing. This family room features a electric kettle, dining area and air conditioning. The front desk is open between 07:00-22:00. Guests arriving after 22:00 must inform the property in advance. Contact details can be found on the booking confirmation. Please note, room cleaning services including bed linen replacement will only be provided every 3 days for reservations with at least 4 consecutive night stays. Clean towels can be upon request. Additional cleaning services can be provided for an additional fee. Additional cleaning services and bed linen changes can be provided at an additional cost. Towel change is available daily upon request. 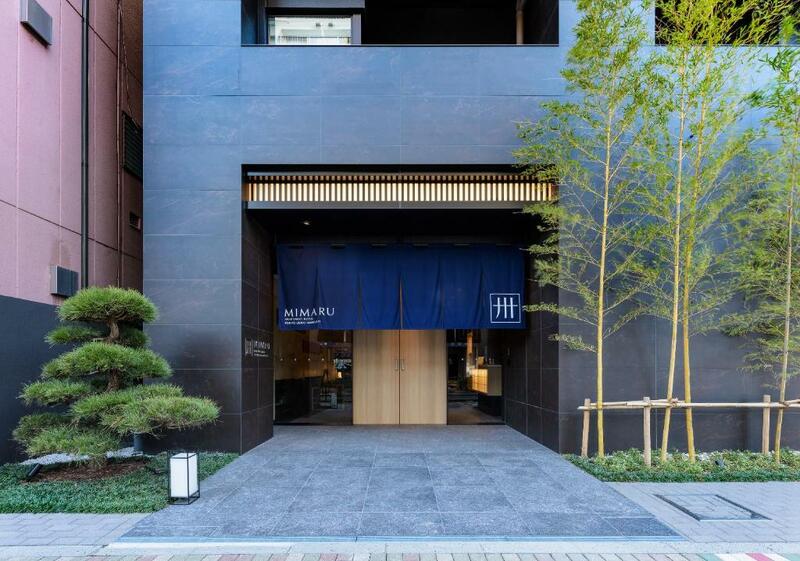 House Rules MIMARU Tokyo Ueno Inaricho takes special requests – add in the next step! MIMARU Tokyo Ueno Inaricho accepts these cards and reserves the right to temporarily hold an amount prior to arrival. The front desk is open between 07:00-22:00. Additional charges apply for late check-in. Please note, room cleaning services including bed linen replacement will only be provided every 3 days for reservations with at least 4 consecutive night stays. Additional cleaning services can be provided for an additional fee. Staff was awesome and super helpful and friendly! It's a little hidden away, but I was able to find it using Google maps and the instructions they sent, be sure to download them at the airport or somewhere with free wifi. No noise from outside well insulated but inside from other floors, you can hear everything. It’s a very family orientated hotel. It would be nice to have tea/coffee in the room rather than collect from foyer and milk on offer too. The cleaning only occurs on the 3rd day onwards of the day. It will be good if the clean is daily like most of the hotel. It is a new hotel and room is clean with cooking facilities. Staffs are very helpful and english fluent. Location is near to UENO station and is accessible to many places of Tokyo. Friendly staff. Convenient location, when arriving from Narita Airport, 10mn walk from JR station and Skyliner Ueno. Close to the subway and multiple convenience stores. More than enough space in the bright looking apartment. Super clean, with the possibility to cook and to heat your meals. And a dining area where we always took our family breakfast and sometimes diner. Air conditioning unit when set to auto, hard to keep the room set at one temperature. the room temperature would always keep on going up making the room very hot. Very friendly and helpful staff. Rooms were a good size. Rooms were generous by Japan standards. Convenient location. Rooms are small, no separate bedrooms. Everything else is really good. Expensive for such small room. a bit of a walk to ueno station. rooms were great and very clean. Staff were very helpful. The staff were super helpful. Room for four people (2 single beds and 2 futons) but was quite small, very little space to store luggage. Subway ride to main tourist areas (Harajuku, Shinjuku, Shibuya) took about 35-40 minutes. Good quiet location within walking distance to main Ueno station. Walkable to Senso-ji and lots of convenience stores and shops nearby. Staff were helpful with booking taxis and also providing directions.